In the 8th century the Moors were the first to erect an impregnable fortress on the castle site (portions still exist on the ramparts). It was one of the principal strongholds in the rebellion of Umar ibn Hafsun, a descendant of a Visigothic count who for nearly 40 years was a thorn in the side of the Arab caliphate at Córdoba. Throughout Murcia and Andalucia, ibn Hafsun and his band of brigands engaged in Robin Hood-style exploits. Expeditions would be sent out against him, but luck would always go his way. During the middle of one all-out siege in 888, the Córdoban amir was poisoned by his own brother and successor. Within three years, ibn Hafsun was at the gates of Córdoba, using Alarcón as a recruiting center for his forces. Though a Moor, ibn Hafsun became the champion of Christians and malcontents against the established Moors and even adopted Christianity himself. Not until 300 years later, during the reign of Alfonso VIII, did the castle fall wholly from Moorish hands, and then only after a nine-month siege. The Christian commander, Fernán Martin de Ceballos, finally scaled the walls alpine-style by sticking two swords into spaces between the stones. The castle was then given to the Order of Saint James and used as a gathering point for further battles against the Moors. With the passage of time, the castle fell into ruins. Its final role was during the Civil War of 1833-1840. The Parador de Alarcón has always been on my top ten list of favorite castle hotels. It was also featured on Discovery Travel Channel’s Uber Guides Top 10 Castle Hotels of Europe (on which I was a talking head). I think the approach up the winding road and the first glimpse of the castle is unforgettable, and the authenticity and integrity of the building can't be beat. Highly recommended! Alarcón is at the halfway point on the main Madrid-Valencia highway—IV. A signpost marks the exit. The town is not practical to reach by public transportation. 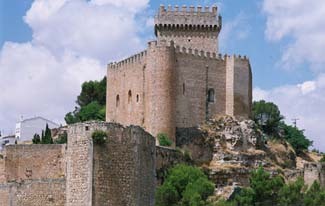 If any Spanish castle can be described as completely authentic, the Parador de Alarcón is that place. Everything a castle buff might look for is here: ramparts, gateways, a keep, a great hall, and slender crenellated watchtowers. Its setting on the plains of La Mancha, just a few miles from the main Madrid-Valencia highway is spectacular, and the approach from the valley up a narrow, winding road through stone archways is unforgettable. With its imposing presence atop a rocky rag surrounded by the Júcar River, you wonder how an army could ever have laid siege to it. Today’s parador maintains the aura of an ancient fortress and is the best-preserved in the provence of Cuenca. A complete renovation several years emphasized the austerity of the building. Paneling came down and the original stonework was brought out. Also added was a fine collection of paintings. True to its original defensive nature, you won’t find big picture windows in the guest rooms. A few still have the original arrow slit windows recessed into the thick walls. For an extra splurge, go for a room with a canopied bed. You’ll find the dining room in the former great hall, with a menu specializing in meat dishes such as local game, lamb, and goat.